How to connect with VPN using AnyConnect in macOS? See also: What is VPN? See also: How do I set firewall rules in Linux to block SSH? See also: How to connect with VPN using AnyConnect in macOS? See also: How do I connect to the VPN using Ubuntu? See also: What is my IP-address and MAC-address? First you must apply for a VPN account. Start Cisco AnyConnect Secure Mobility Client. 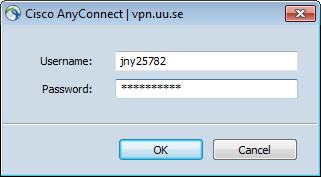 Enter vpn.uu.se and press Connect. Enter Username and password A and press OK. When connected it should briefly look like this. Open the client again by for example clicking the little icon in the toolbar.